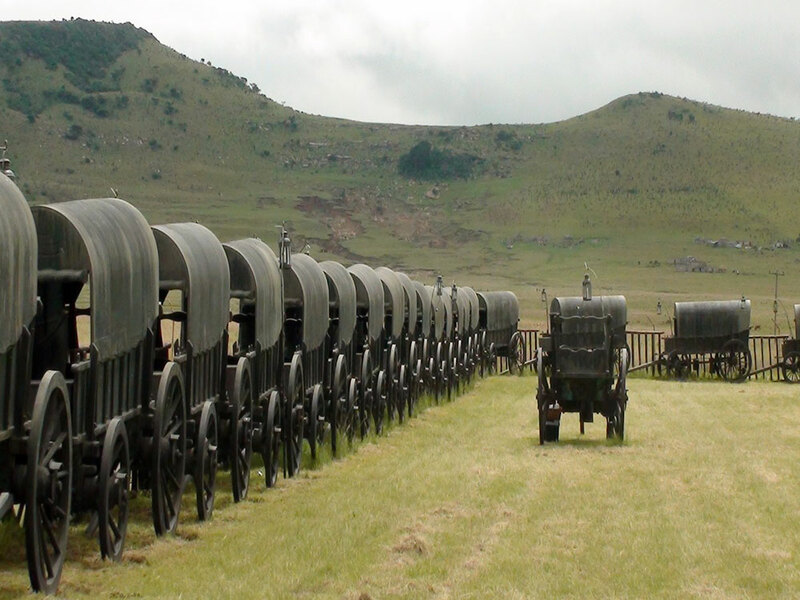 Our area has seen tremendous military clashes over the past 200 years. 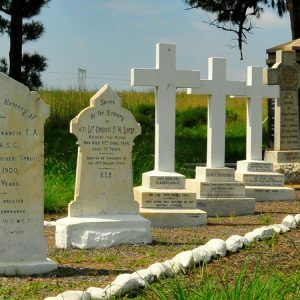 Here African, Zulu, Boer and Brit have clashed in conflict and these battles have shaped the history and future of our country. 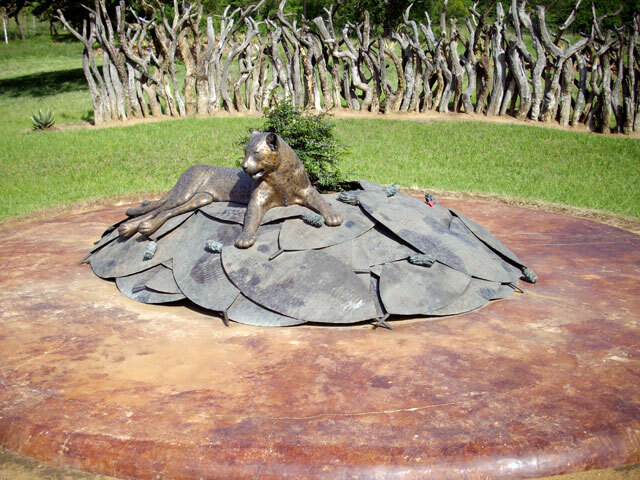 Knowledgeable guides will show you the sites and recount epic tales of battles, bravery and betrayal. 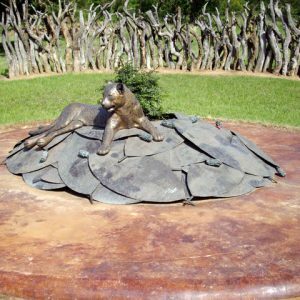 Well known or the more unusual and locally known sites are all part of the experience of your visit to the area. 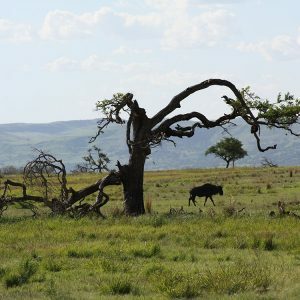 If you sit quietly on one of the battlefields and allow your guide to conjure up images of events from the past, you might just be able to hear the long-ago sounds of spear against shield, bayonets and lead bullets, horses charging, shouted commands and the groan of a soldier, falling wounded to the ground. 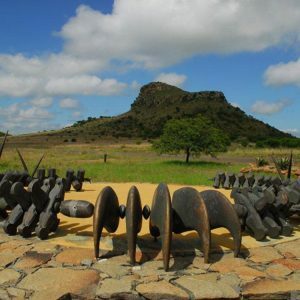 History is all around you as you listen to these accounts that bring the past alive at the actual sites. 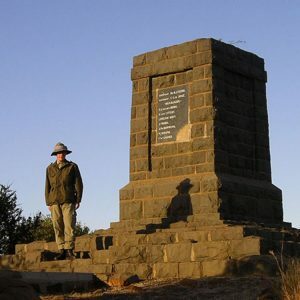 Site of the biggest defeat by the British in Africa in Victorian Colonial times. 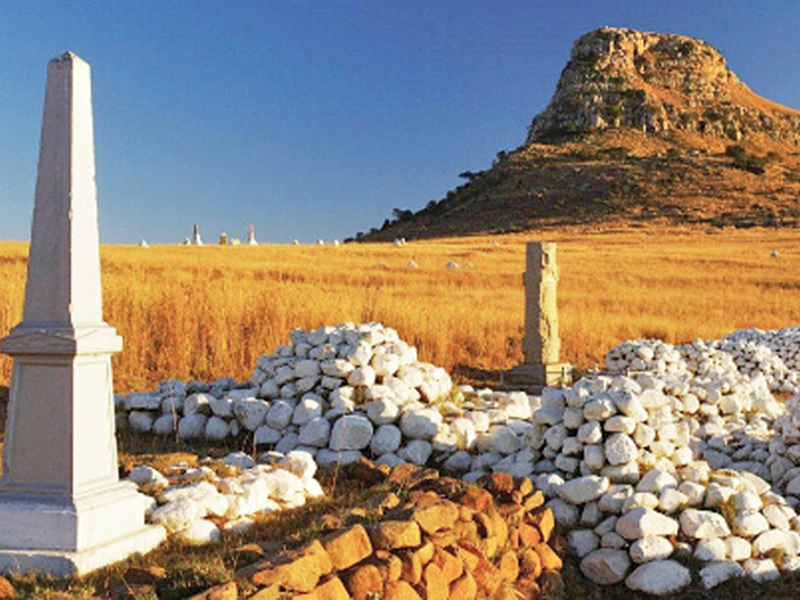 Isandlwana is arguably the most evocative battle site in South Africa. 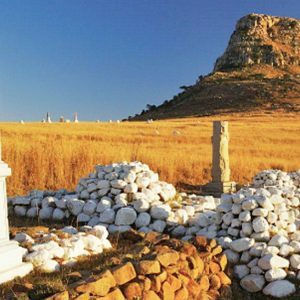 Hundreds of whitewashed stone cairns marks the last resting place of the troops killed there, with the brooding bulk of the distinctively sphinx-shaped mountain of Isandlwana providing a dramatic back drop. 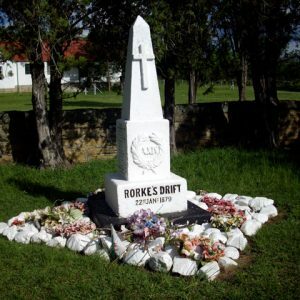 Immortalized by the Stanley Baker / Michael Caine film “Zulu”, the battle at the Swedish Mission Station of Rorke’s Drift has become world famous. 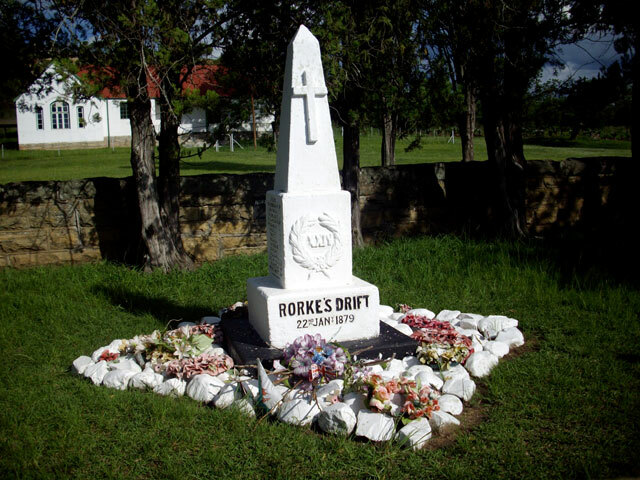 “4000 men of the Zulu army from Isandlwana, went on to attack the Swedish Mission station, at Rorkes Drift later the same day, but were beaten off by the 100 men of British Garrison during a 12 hour engagement. 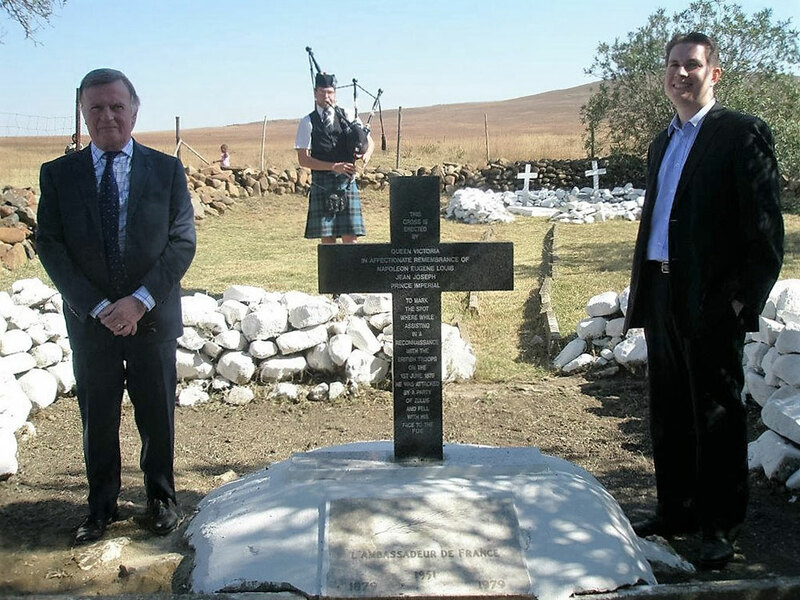 11 Victoria Crosses were awarded to the defenders, with seven to the 24th Regiment (now Royal Regiment of Wales). 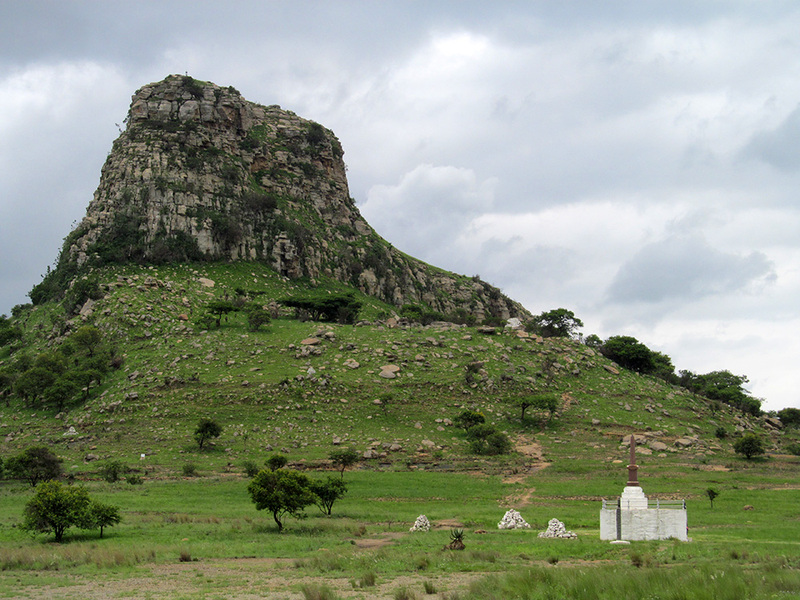 Here, the Voortrekkers defeated a Zulu army on 16 December 1838. 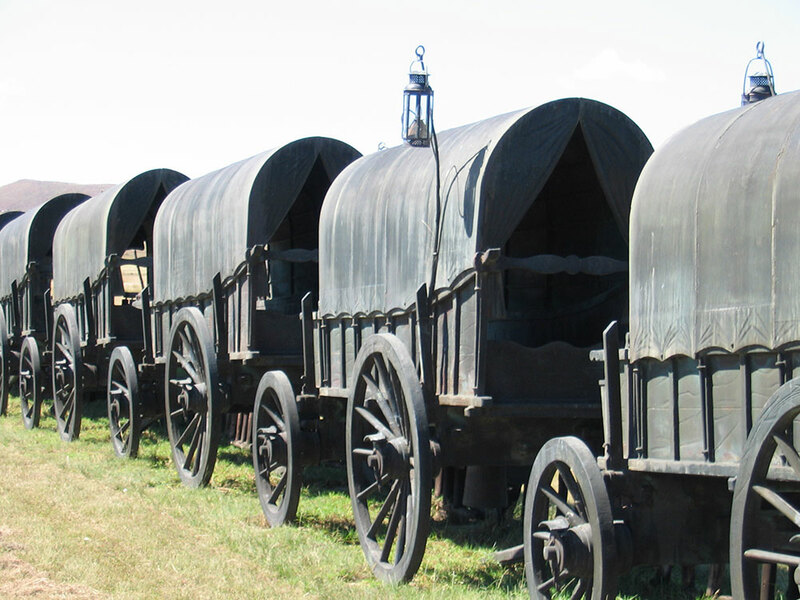 A replica laager (circle of wagons) of 64 wagons has been erected on the site of the Battle. 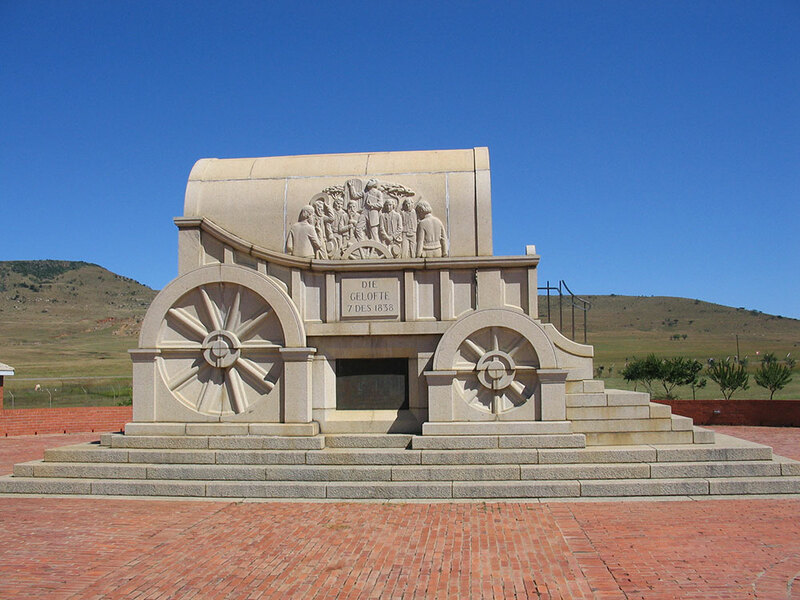 A commemorative wagon erected at the time of the centenary, in 1938, stands at the entrance. 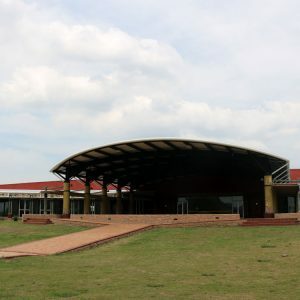 Interpretation Centre and small museum, coffee shop and curio shop on site. 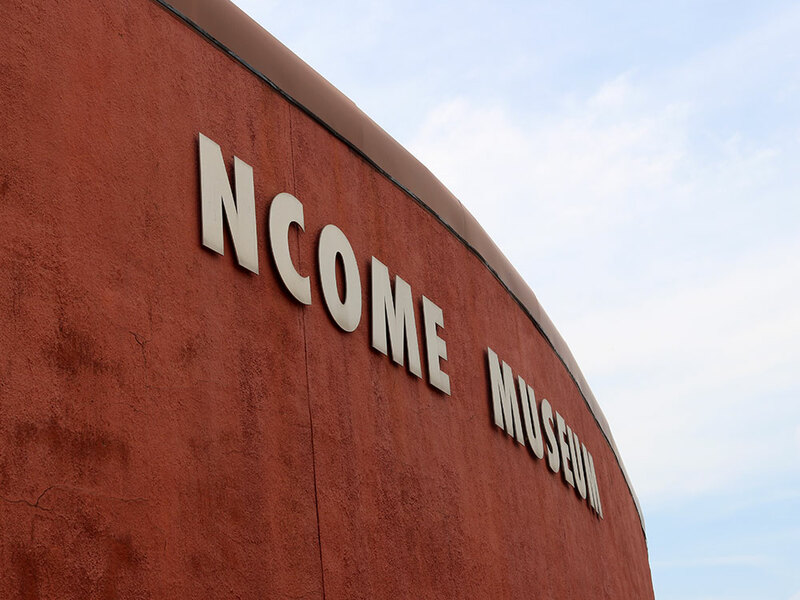 Across the river from the Blood River site is Ncome Museum. 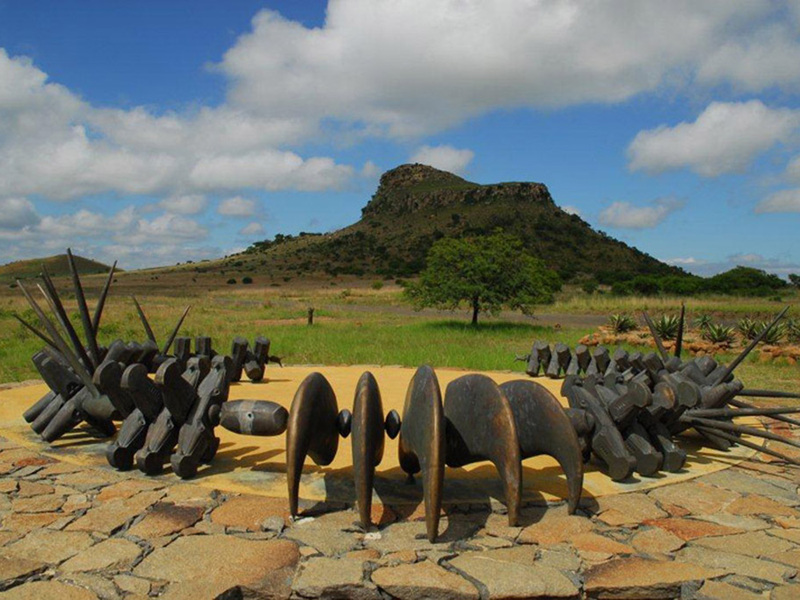 Built in the traditional bulls’ horn attack formation of a Zulu Impi (army), the display depicts the history and culture of the Zulu people and tells the story of the battle of 16 December 1838. 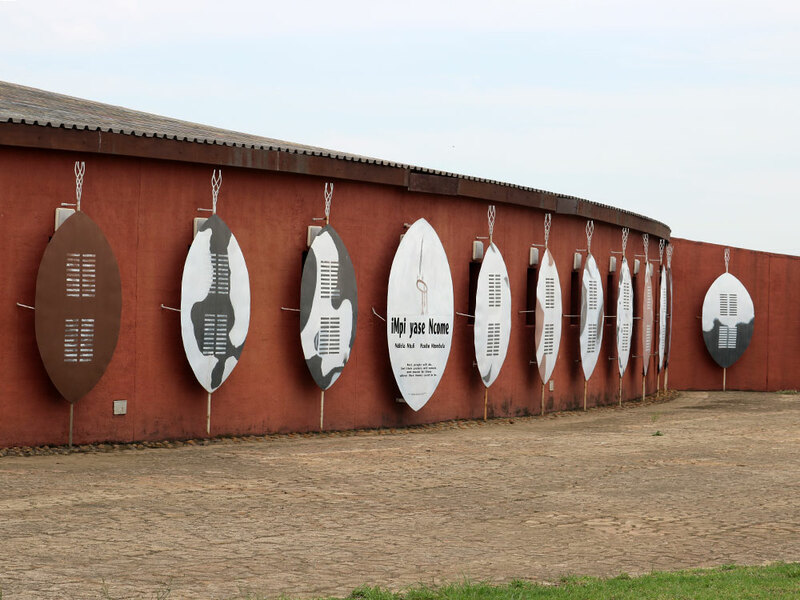 An impressive display of metal replica Zulu shields are fixed to the exterior wall. 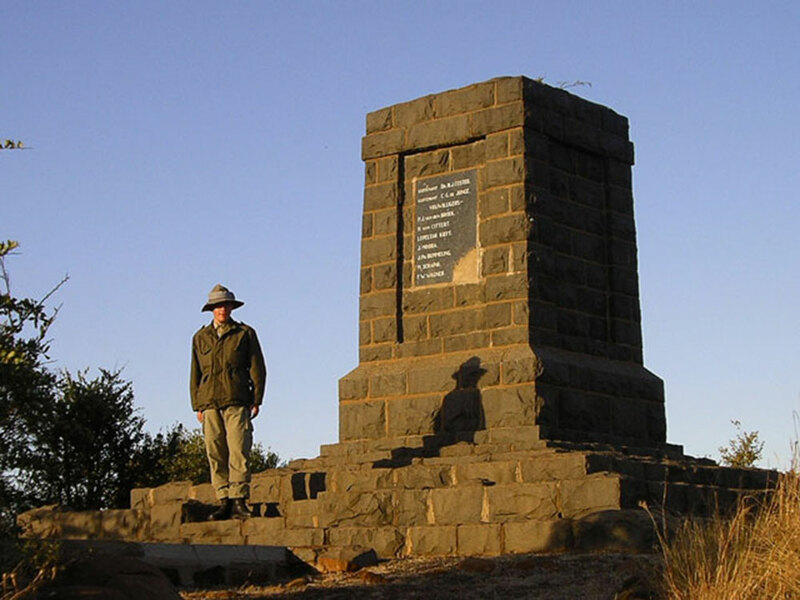 The second battle of the Anglo Boer War, fought to open the railway line between Ladysmith and Dundee. 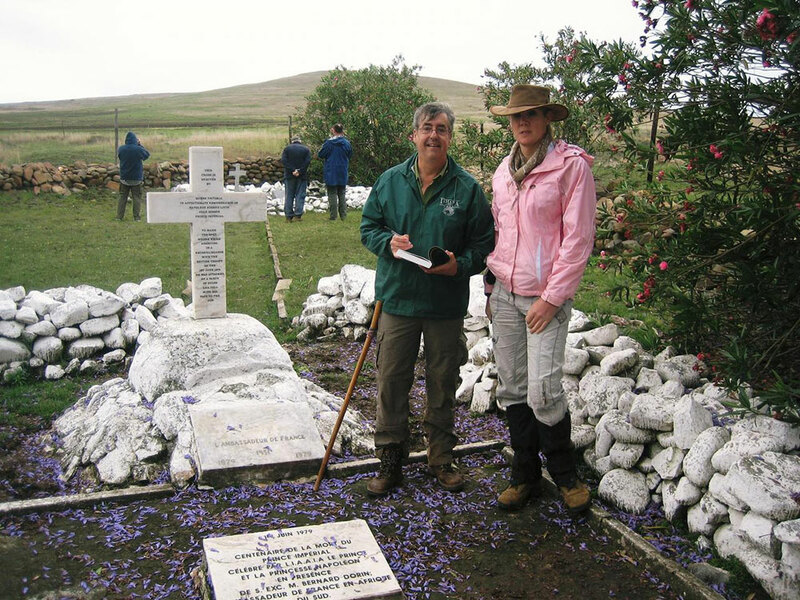 Memorials on the hills and two cemeteries record the battle fought here between the British and Boer forces. 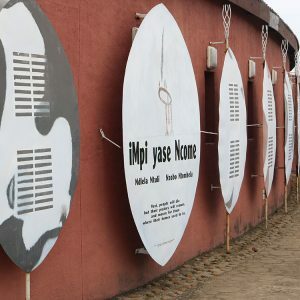 The literal translations of the name of this village is “to help each other”. 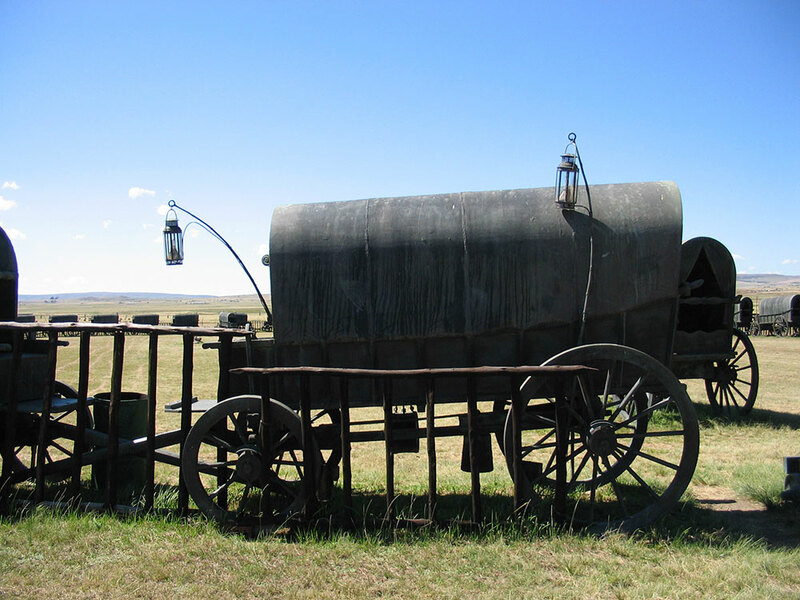 This derives from the need for a double span of oxen to pull a heavily laden wagon to the top of the mountain pass. 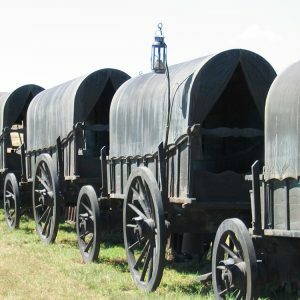 In many cases wagon drivers had to assist one another. 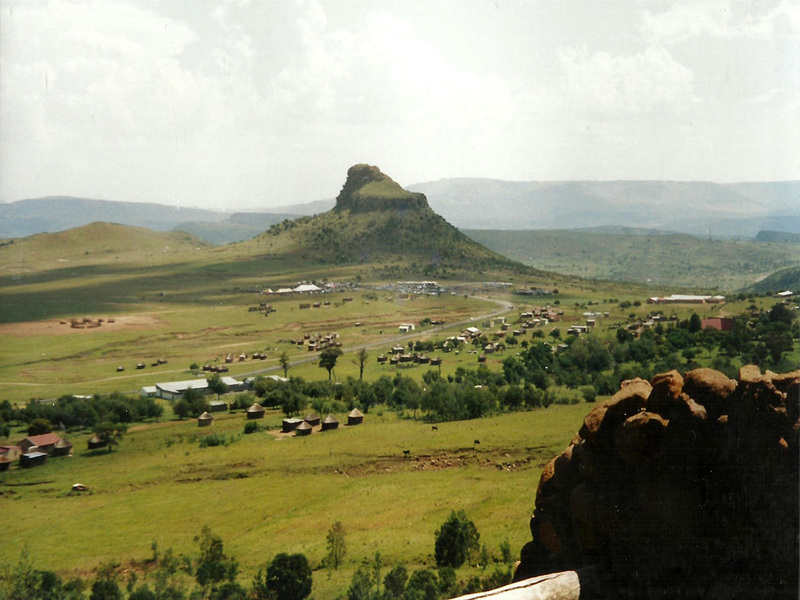 This tiny village was the base camp for British troops in the Anglo Zulu War in 1879. 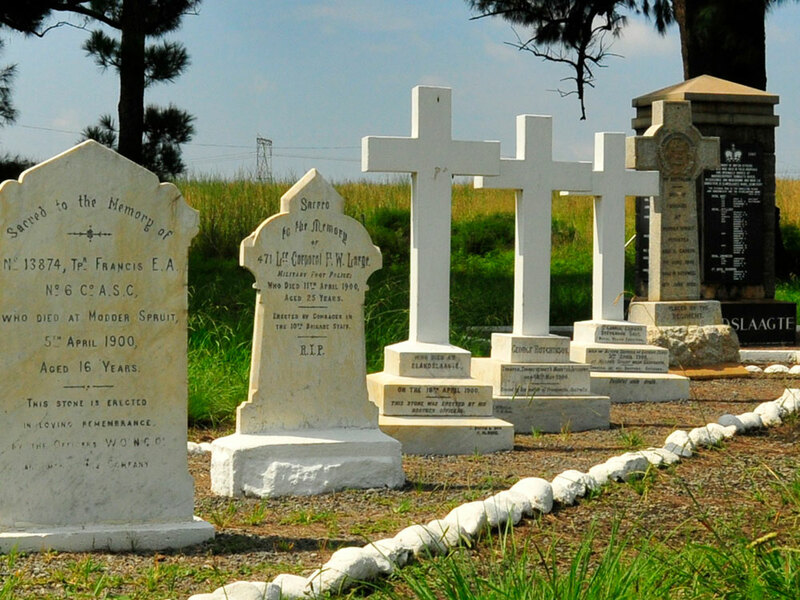 The cemetery is a stark reminder of the loss of life in war. 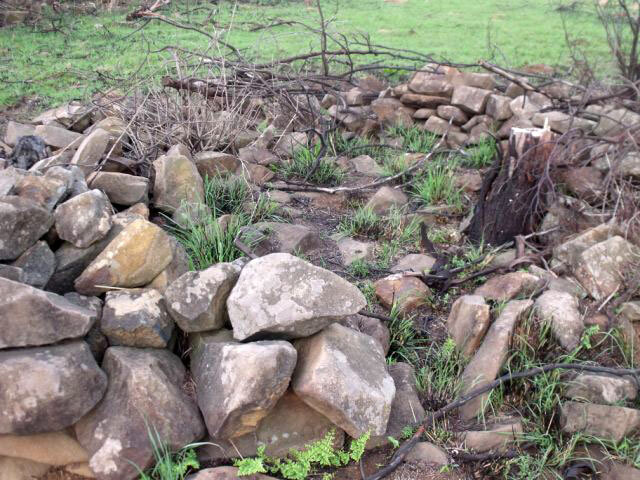 There are remains of Boer fortifications from 1899-1900 on the top of the hill. 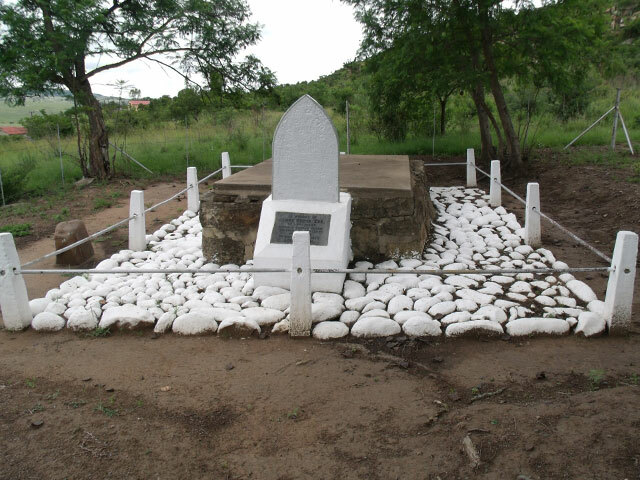 A memorial marks the spot where Louis Napoleon, the Prince Imperial of France was killed on 1 June 1879. 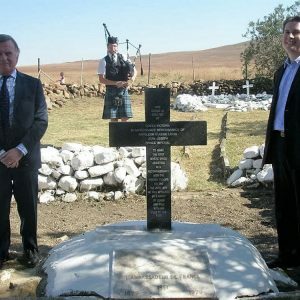 His body was returned to England for burial. 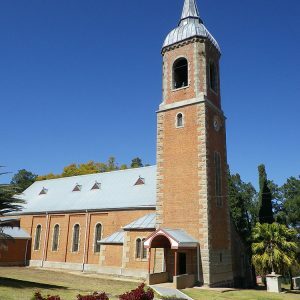 Maria Ratschitz mission was established by the Trappist monks in 1888. 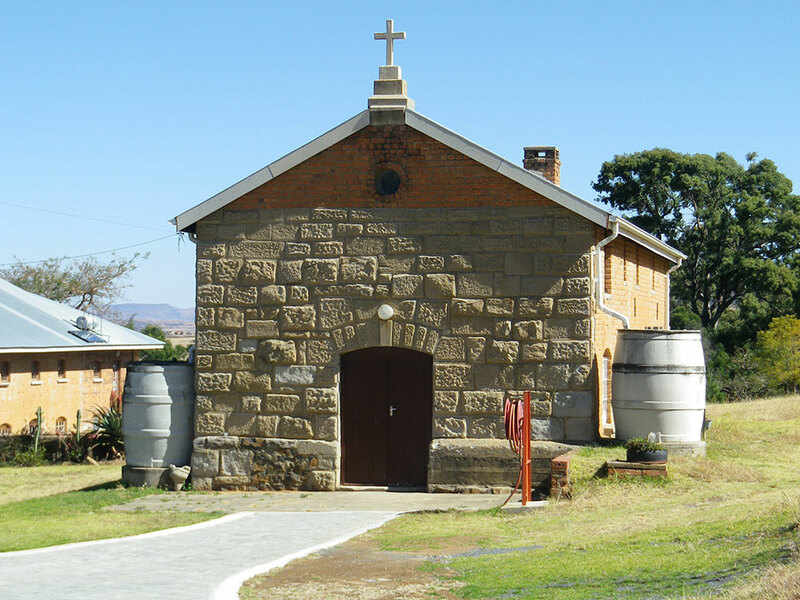 The mission is set on 3200 hectares of land and nestles in the fertile Nkunzi valley at the base of Hlatikulu Mountain.The spire of the beautiful church can be seen from great distances and the peal of the church bells can be heard throughout the valley.In 1886 two silent Trappist monks from the Marianhill monastery chose the site for the mission station as it reminded them of the Bavarian area from which they originated.Maria Ratschitz was a daughter house of Marianhill, outside Pinetown. 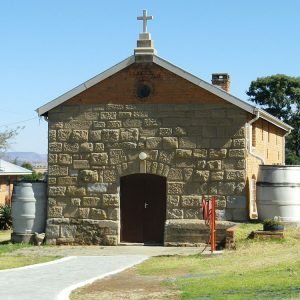 The mission was established on the farm Boschkloof in the Biggarsberg, which was purchased by Father Franz Pfanner for approx.₤ 6000. 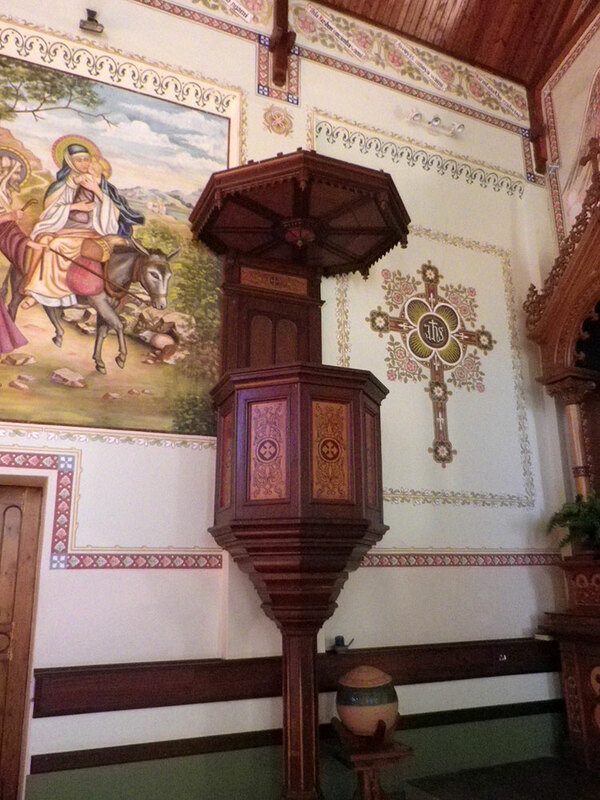 It was named Maria Ratschitz after the Marian shrine in Leitmeritz in northern Bohemia. The two monks lived in a simple wattle and daub cottage. The framework for this cottage was two huge yellowwood tress from the forest. 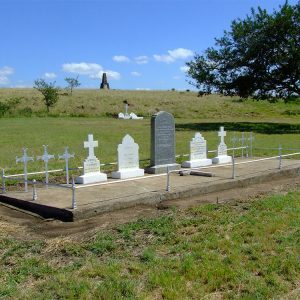 An important aim of the agricultural order of Trappists was to create productive agricultural communities of African converts – to stimulate the emergence of independent agricultural farmers. 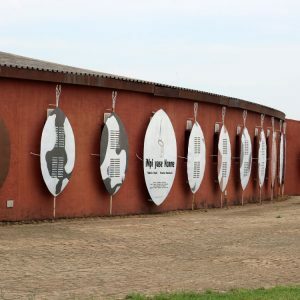 They taught the dignity of labour and the principles of sound farming. 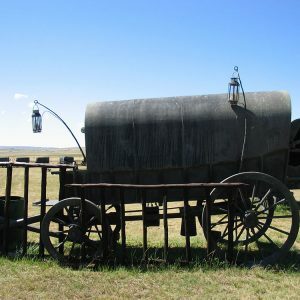 They also instructed the young men in the skills of wagon building, wheelwright’s work, blacksmithing, wine making and cooperage, building, carpentry and shoemaking.The relationships with the surrounding farmers and miners were good. 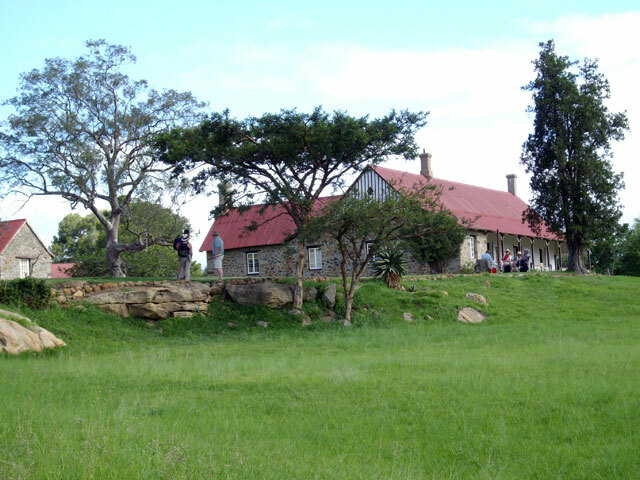 A school was opened, and by 1907 had 112 pupils. The monks also provided medical care. 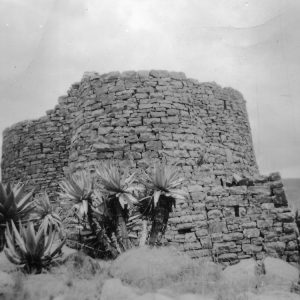 Between 1905 and 1910 the first substantial church was built. 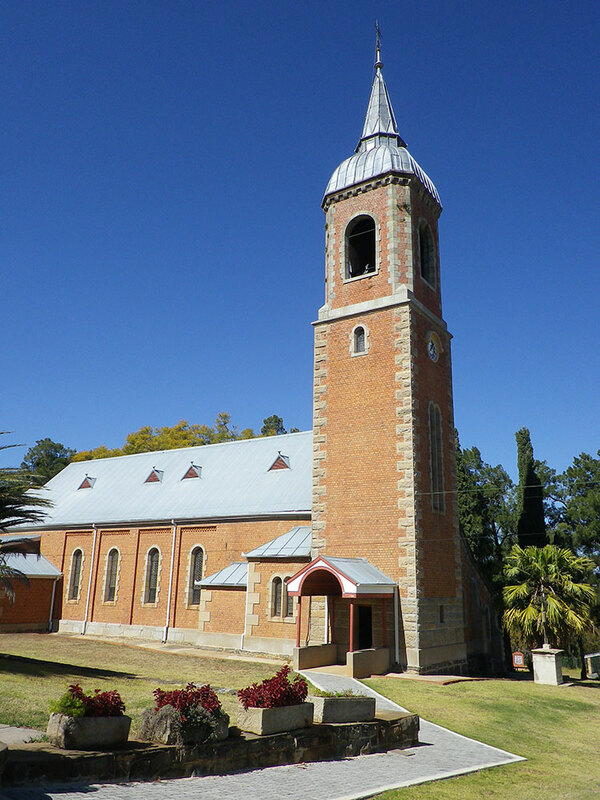 The church with its tall elegant bell tower had magnificent stained glass windows, lovely frescoes and a carved high altar and pulpit.As mission land, Maria Ratschitz had been exempt from the provisions of the 1913 Land Act, which formed the basis of the territorial segregation between black and white people in South Africa. 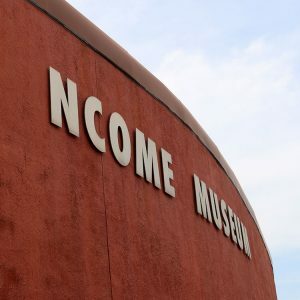 In 1936, this period of exemption came to an end. 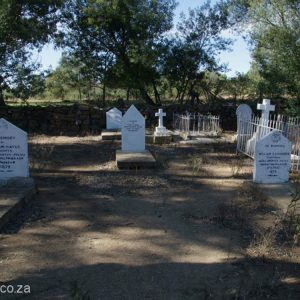 In terms of the new law it was no longer possible for the owners of Maria Ratschitz to sell off sections of the farm to Africans. 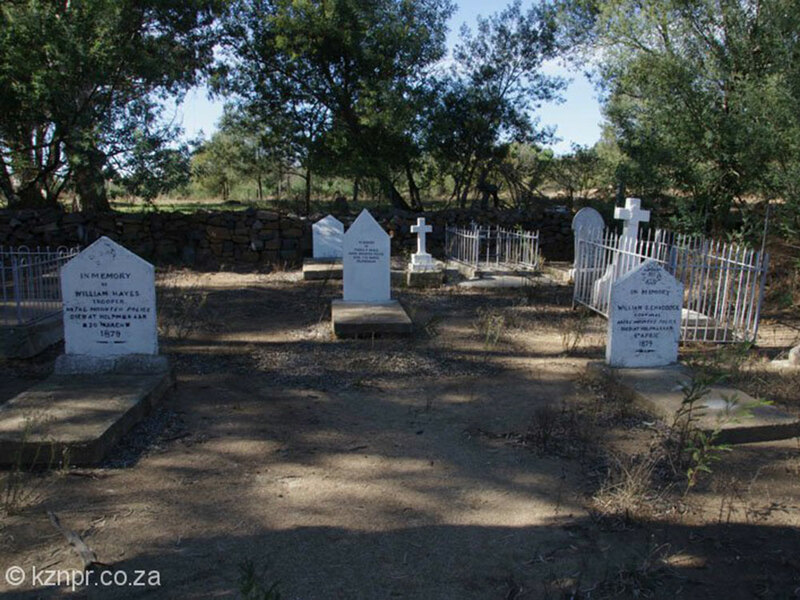 At the stroke of a pen the 1936 Land Act cancelled out the missionary vision of a vigorous and economically stable and land owning group of farmers at Maria Ratschitz. 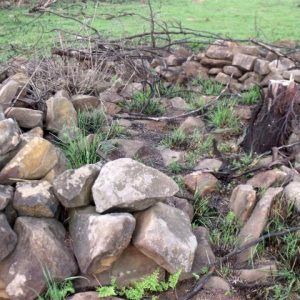 As tenants on a farm in a “white” area, the people were now vulnerable to eviction. 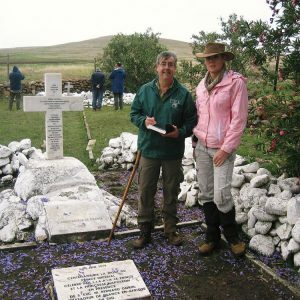 The outbreak of the Second World War had a devastating effect on the mission. 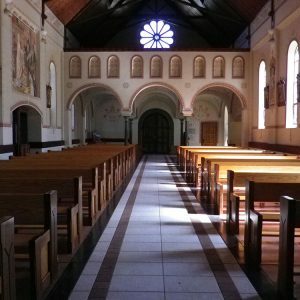 The German Trappist monks were interned and financial support from Germany came to an abrupt end. 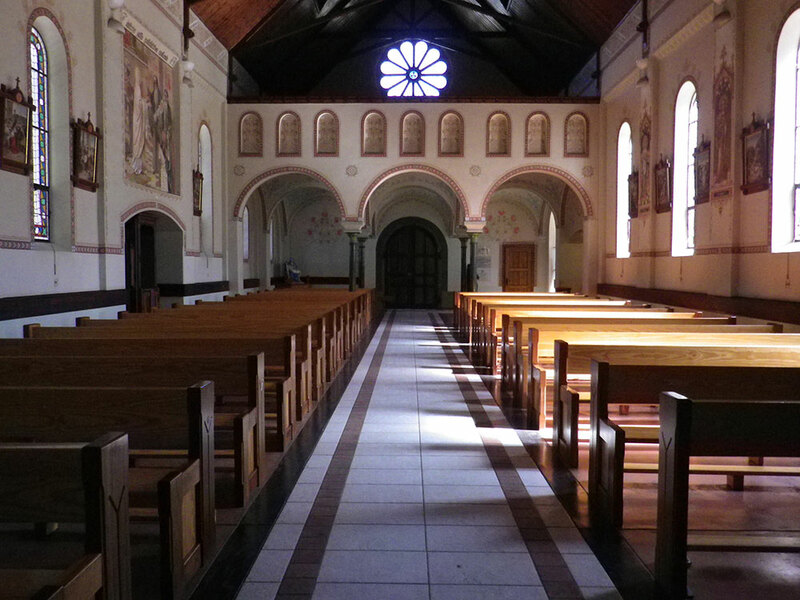 The Trappists never returned to the mission, which was subsequently staffed by other orders – French Oblates and later English Franciscans. These orders did not have the same agricultural expertise as the Trappists. 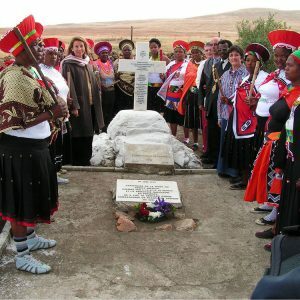 In 1967 the government informed the Maria Ratschitz tenants that they would be removed in 1968 to a black area. 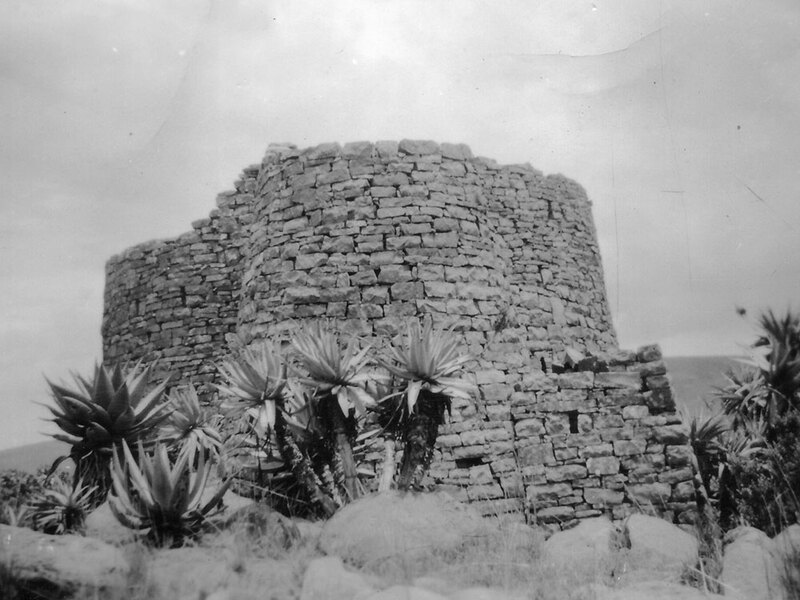 With no resident priest the buildings fell into disuse and slowly deteriorated. 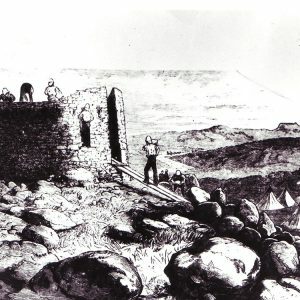 Then a plan for the restoration and development of the mission was begun by the Bishop of Dundee, into whose Diocese the mission fell. 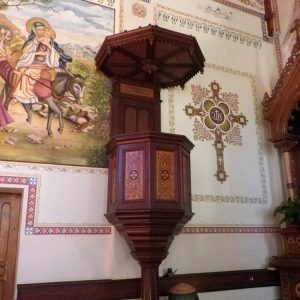 An anonymous donation from Germany was received for the purpose of restoring the church of Our Lady of the Seven Sorrows. 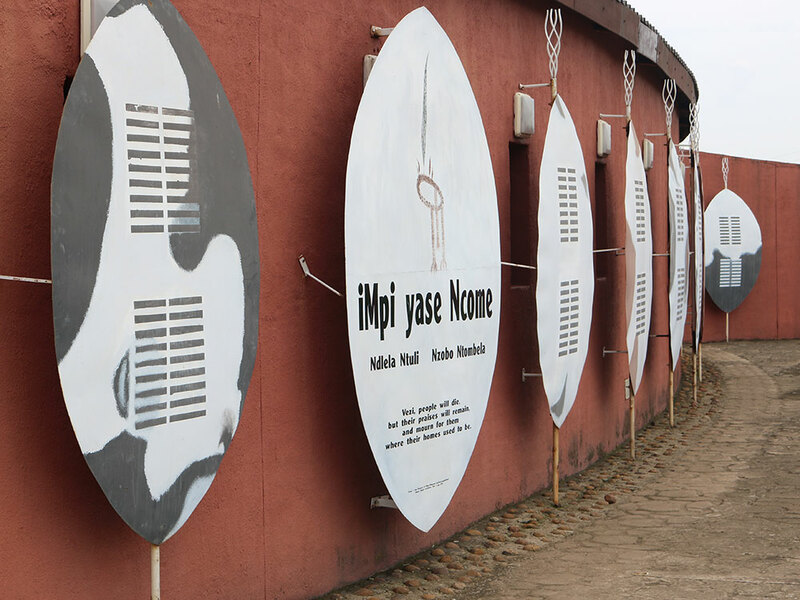 Plans were drawn, a community forum set up and slowly the buildings were transformed.The restoration and new life at Maria Ratschitz has been an inspiration for the community in the valley. 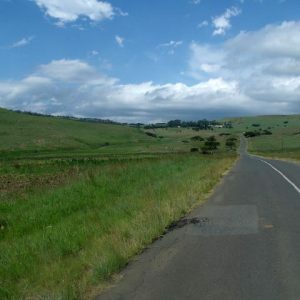 From Dundee take the R602 past Glencoe and towards Ladysmith. 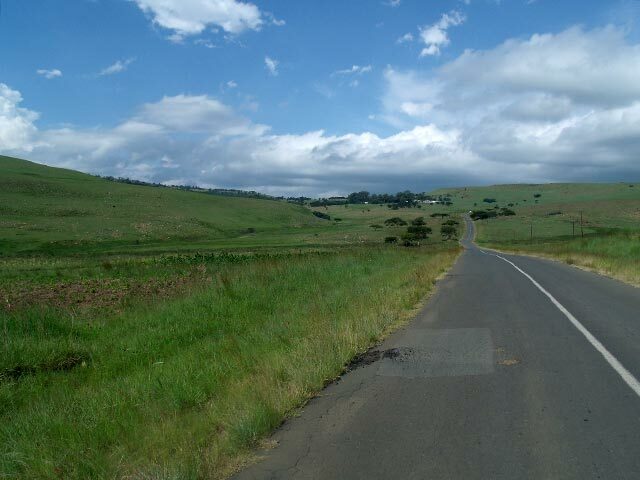 At the 4 way intersection in the Wasbank valley turn right on the gravel road to Collings Pass. 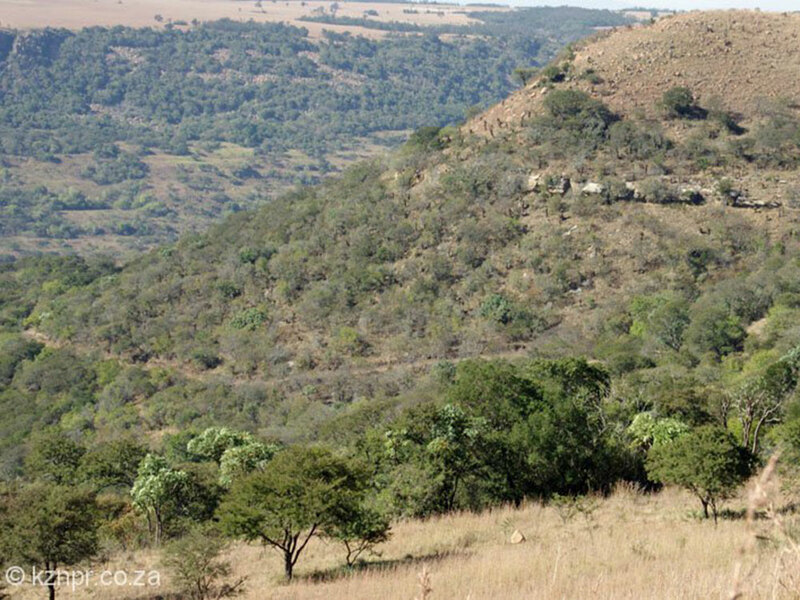 Shortly after passing the Zulu homesteads close to the road you will see the sign and entrance gates indicating the turn off to the right. Follow the gravel road to the mission. 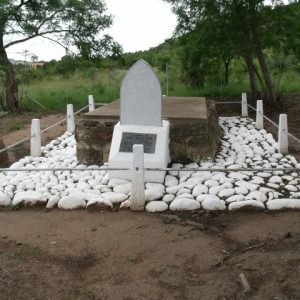 On the banks of the Wasbank river, below Indumeni Mountain, the Voortrekkers made a Vow that if God granted them victory in the forthcoming battle with the Zulu forces they would hold the day sacred and build a church in Hid memory (the Church of the Vow in Pietermaritzburg). 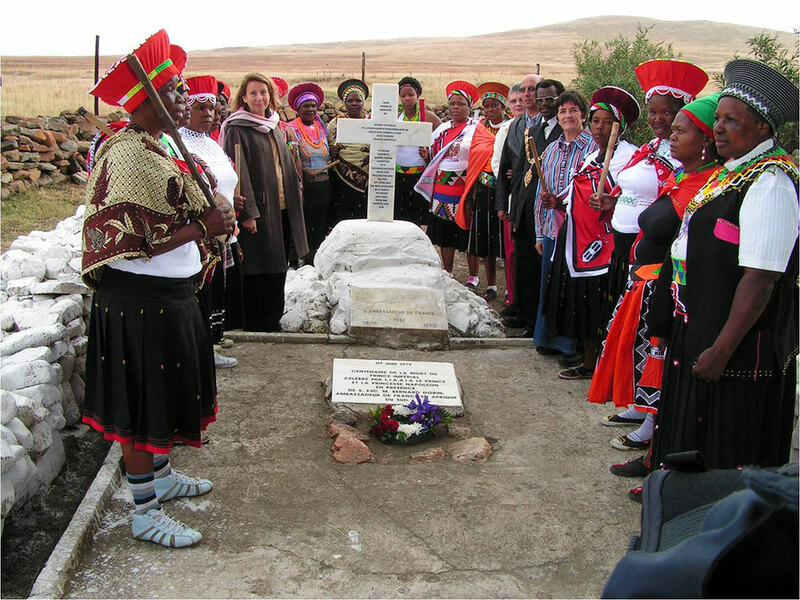 A public holiday on 16 December (Day of Reconciliation) recalls the battle of Blood River / Ncome. 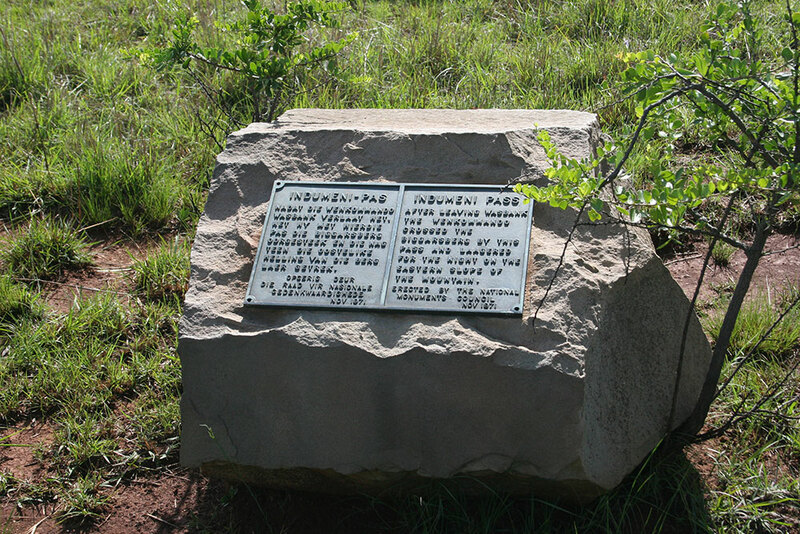 On the right side of the road just before the Wasbank River bridge a stone plinth indicates the site. 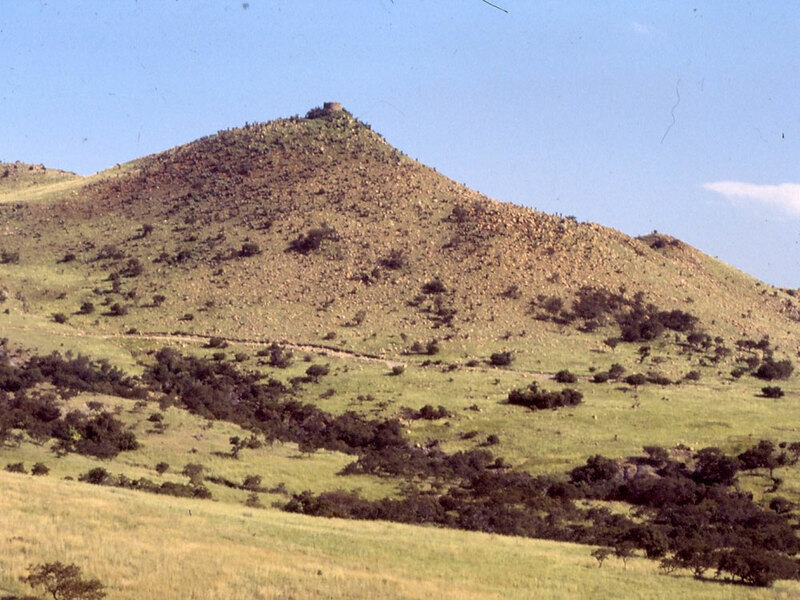 The road from Wasbank to Dundee, up and over Indumeni Mountain, follows the route taken of the Voortrekker Wenkommando (Victorious Commando) on their way through this area to fight the battle against the Zulus on the banks of the Ncome River. As you reach the crest of this scenic pass you can look down into the Wasbank valley and ahead into the Dundee and Glencoe valley. 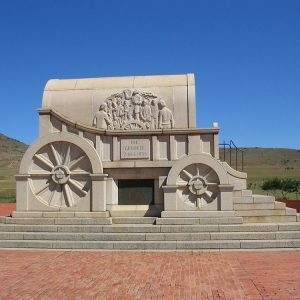 A memorial on the farm boundary on the crest of the pass (on the west side of the road) commemorates the Voortrekker struggle to haul their wagons to the top of the mountain. They called this the “Mud Mountains”. 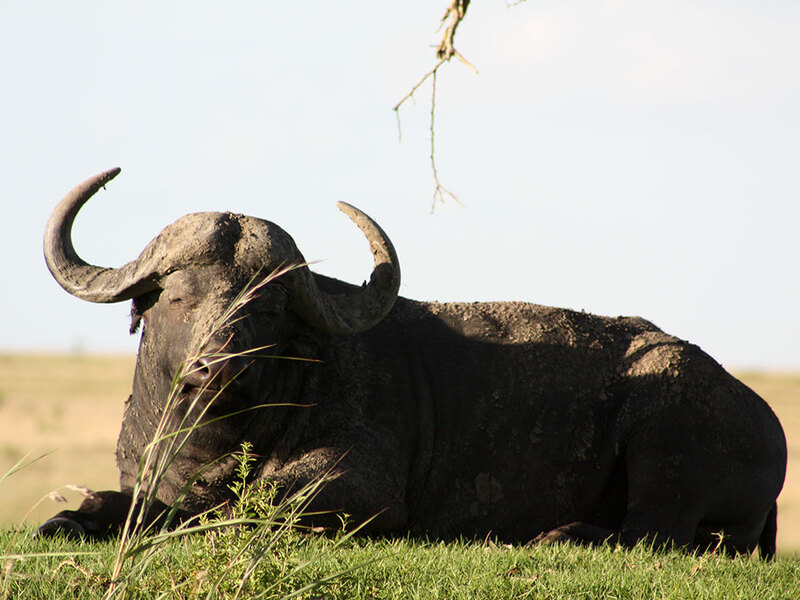 As a result of the large rocks and quantities of mud with which they had to contend. 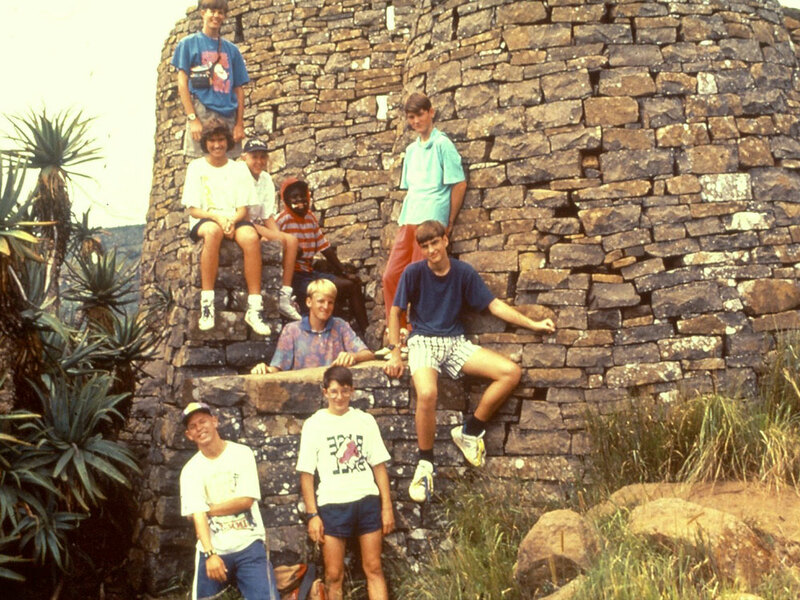 Find out why Fort Mistake is neither a fort nor a mistake. 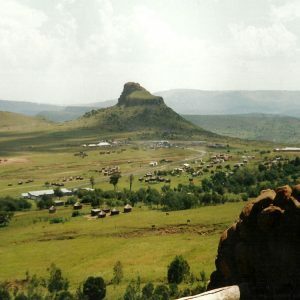 On the western heights of the Biggarsberg, Mkupe Mountain towers above the headwaters of the Inkunzi River and looks down on the strategic pass to which it gives its name. 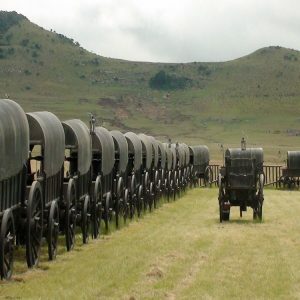 In 1879 and 1881 during the Anglo-Zulu War and the 1st Anglo Boer War, this pass was of vital concern to the British Army, as it was their supply line between military head quarters in Pietermaritzburg and the Frontier stations of Newcastle and Dundee. 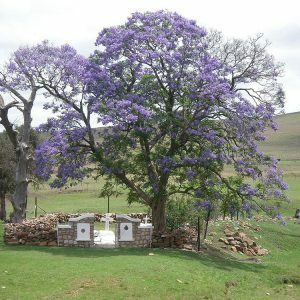 It was the shortest route for any Boer invading force to strike at the communications system of the British defending forces and the quickest route to take to Ladysmith. 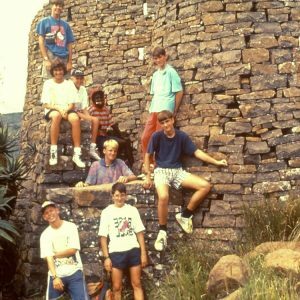 “Mkupe” is an old Zulu name meaning the fouling of the “Eagle’s Nest”. To this day the black eagles nest along its cliffs. The clue to the truth lies in a series of drawings and a brief report by the famous war correspondent of the “Graphic”, C.E. Fripp. 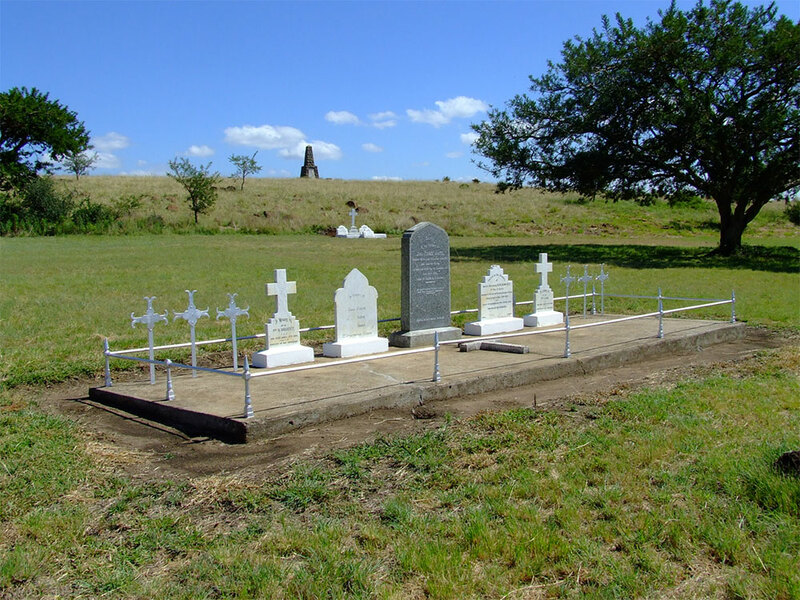 Sometime early in March 1881, after the disastrous defeat of Majuba, he was hastening down country from Newcastle. 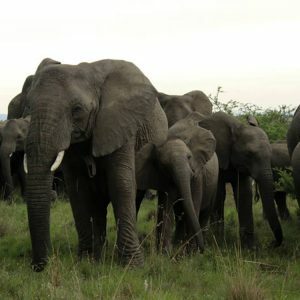 At Mkupe Pass he found frenzied activity. During the armistice the British were making preparation for a fresh outbreak of war, should peace negotiations break down. 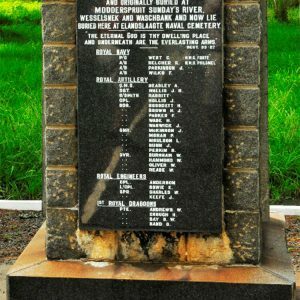 Colonel Sir Evelyn Wood, who recognised Mkupe as one of the strongest strategic positions in Natal, was supervising the erection of a series of forts as signal stations on the line from Ladysmith to Newcastle – at Sunday’s River, at Mkupe, at Dannhauser, at Ngagane and at Newcastle itself. 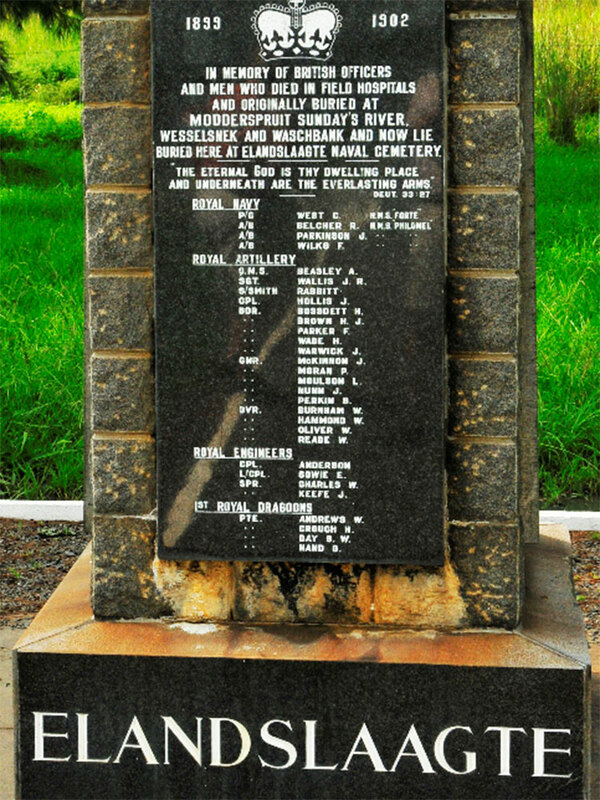 At Mkupe the fort was a building on a small knoll marked as One Tree Hill on the map. 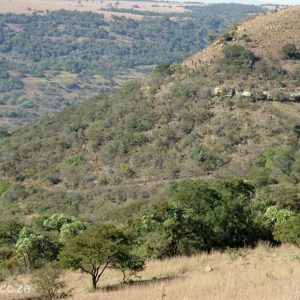 The fort took this name and was referred to 16 years later when Major Henderson’s Intelligence report and maps for the area in 1897 referred to two forts overlooking the vital road link – Fort One Tree Hill and Fort Mkupe. 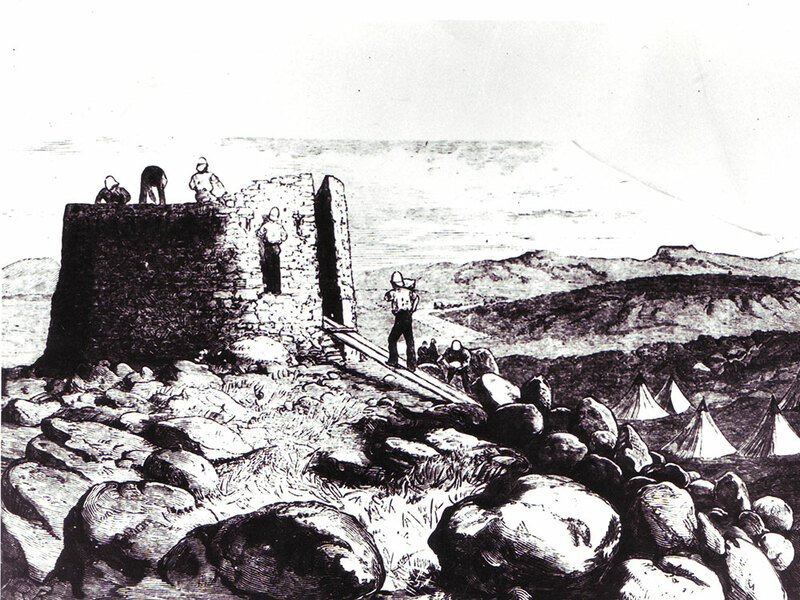 On his trip through, Fripp had just time to make some sketches of the camp of the 80th Regt., and of the building, a neat, dry stone-walled “Fort overlooking the Newcastle Road”. The “Mistake” is the responsibility of an unknown cartographer. 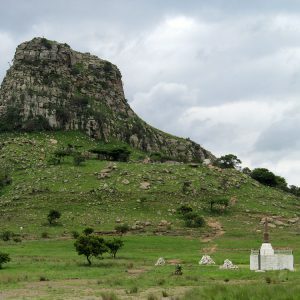 Up to 1910 “One Tree Hill” is always shown to the east of the road and Mkupe Mt. written large to the west. The road has not changed position. 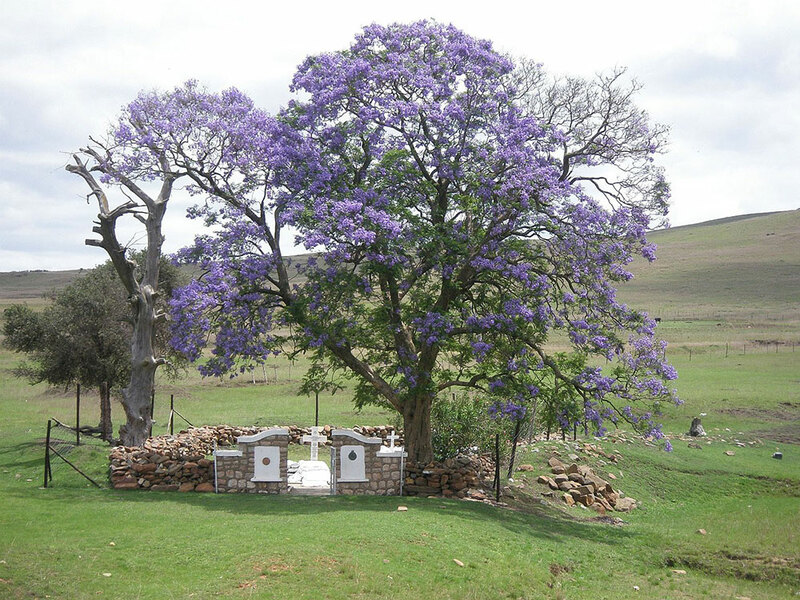 But after 1910 the name Mkupe slipped off the map and “One Tree Hill” took its place. 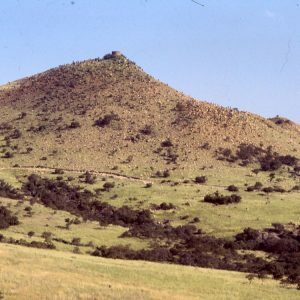 In 1924 when an expedition from Witwatersrand University came to marvel at the remarkable and unique fort and to ask for its declaration as a National Monument, its name was firmly fixed in local minds as Fort Mistake and as such Fort One Tree Hill remains. 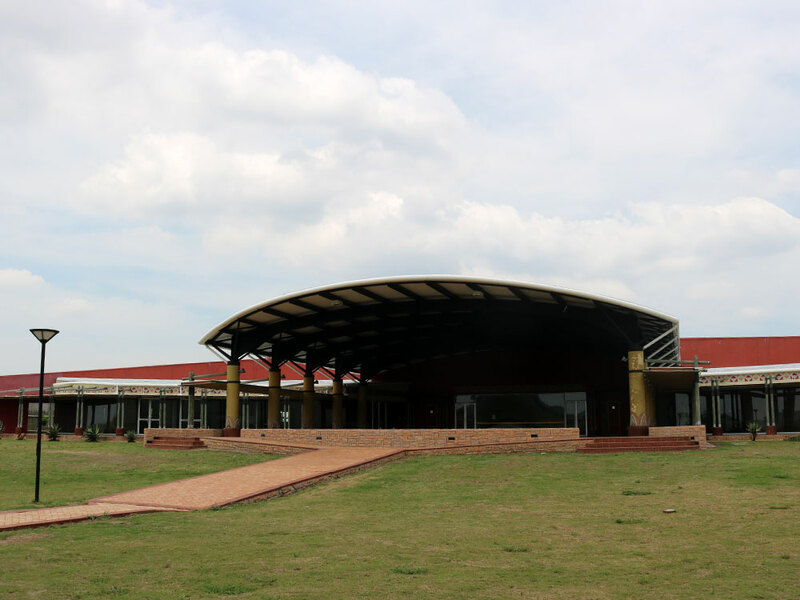 On 22 000 magnificent acres near the town of Ladysmith Nambiti is a major attraction of this region. 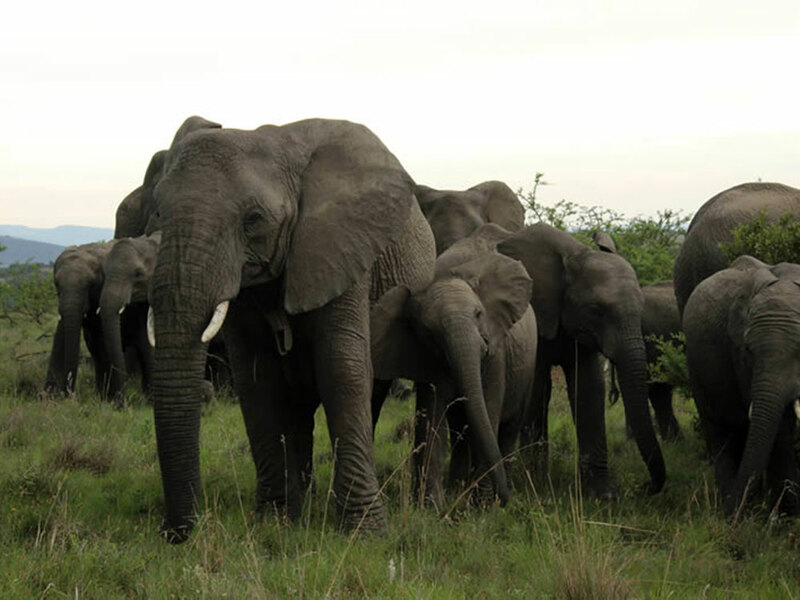 Nambiti’s game rangers are bushwise and knowledgeable, and their insights add depth to every game drive. 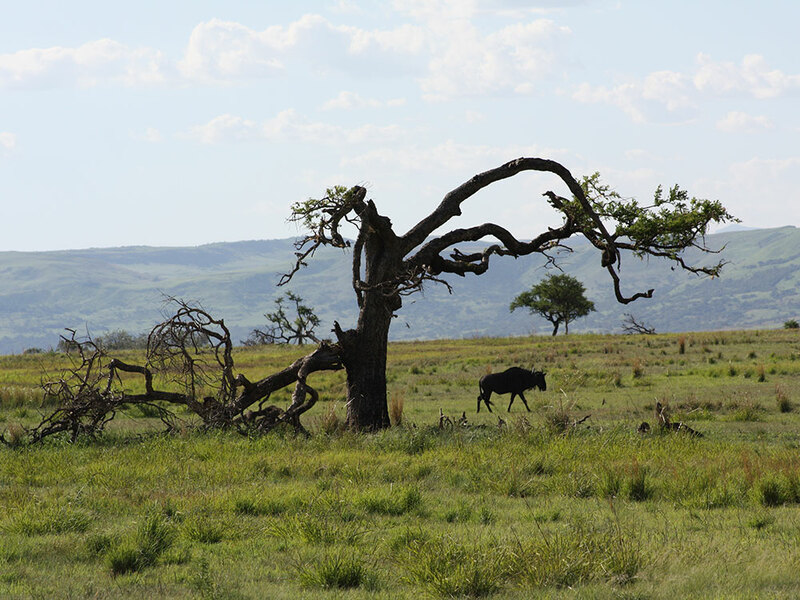 In 2000 Nambiti Private Game Reserve was born. 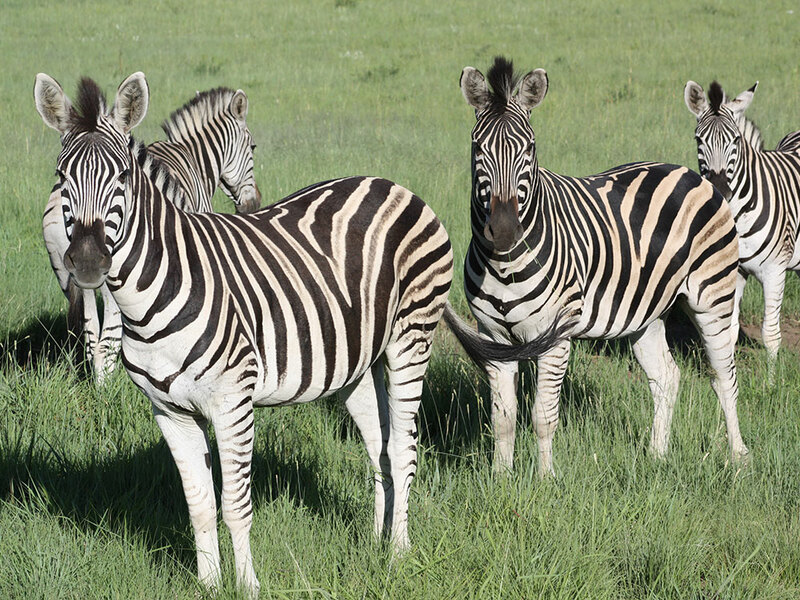 Working closely with conservationists and wildlife experts, the area was restocked with naturally occurring wildlife. 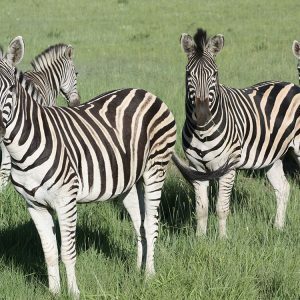 Over the next five years, internal farm fences were removed, alien vegetation was cleared and the now game-fenced reserve was restocked. 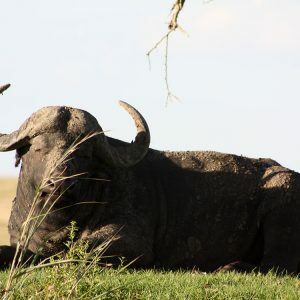 Along with the endemic species driven out by farming practices, the Big Five and many other types of game were introduced. 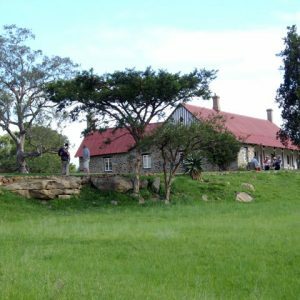 Over time, three more farms were acquired and in the following years superb lodges were built or renovated from existing farmhouses.